The WU5205 is an IEEE802.11b/g/n mini-size USB adapter that can connect notebook, handheld or desktop computer equipped with USB interface without the hassle of cabling or wiring, which significantly brings mobile workers the freedom of staying connected to the network while roaming around a building or multiple buildings maintaining access to the Internet, e-mail, networked applications, and print services. The WU5205 fully complies with IEEE 802.11n draft 3.0 and IEEE 802.11 b/g standards, delivers reliable, cost-effective, feature rich wireless connectivity at high throughput from an extended distance. It supports WMM and WMM-PS (IEEE802.11e QoS standard) also has an innovative built-in WPS (Wi-Fi Protected Setup) function which can build a connection between an AP and synchronize the encryption settings. 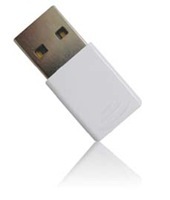 Abocom WU5205 11b/g/n Wireless Adapter Mini-size Wireless LAN USB2.0 Adapter User Manual.